You are here: Home / Mutual Funds / Mutual Fund Units Transmission procedure | How to get Mutual Fund units transferred upon death of a Unitholder? What is the basic logic behind making these investments? A majority of us do it, in order to ensure the financial well-being and security of our beloved-ones. But, what happens to your financial assets if you meet your end unexpectedly? What will happen to your investments? Who will own your assets after you are no-more? It is very important that our loved ones are able to avail the timely benefits of our investments and inherit the assets without any hassle. The redemption or transmission procedure in case of mutual fund investments is very clear and straight forward. All fund houses follow a uniform, well-documented process when it comes to the transmission. In this post, let us understand about Mutual Fund units transmission process. 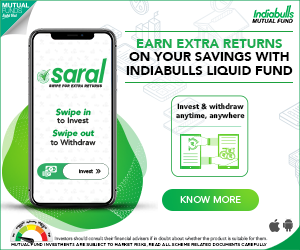 How to redeem or transmit mutual fund scheme units in case of unitholder’s death? What are the required documents to transfer mutual fund units? Is it possible to transfer or gift mutual fund units? .. . In the case of mutual fund investments, the units held by the deceased unitholder are transferred to the surviving unit holder (if investments are jointly made) or nominee or the legal heir, this process is known as Transmission. Units of a mutual fund are transferred to a surviving member in case of an untimely demise of the first holder, it is known as ‘transmission’ of mutual funds. On the other hand, a ‘transfer’ is said to happen when all the unitholders are alive. But, both the words are often used interchangeably. As per the Securities and Exchange Board of India’s (SEBI) regulations, 1996, transfer of mutual fund units is allowed. However, the fund houses don’t allow all the unitholders to transfer their units, en masse. Who can claim MF units? If the investments are in the name of one investor only (sole unit holder) then units can be transferred to the registered nominee. It is also possible to have multiple nominees for a folio and in such cases, each nominee will be allotted the apportioned number of units as per the intent of the original (deceased) investor. In case, the registration of nominee has not been done then the legal heir(s) of the deceased investor will have to claim the units by producing required documents and proving heirship. Kindly note that this transmission process might take anywhere between 10 days to a month. What are the required documents for Mutual Fund units transmission / redemption upon death of the unitholder? Letter from surviving unitholders to the Fund / AMC / RTA requesting for transmission of units. 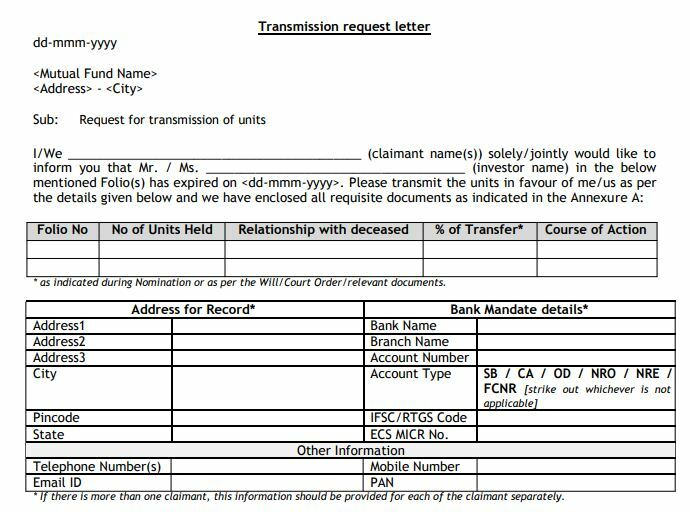 Below is a sample ‘transmission request letter’. Death Certificate in original or photocopy duly notarized or attested by gazette officer or a bank manager. Bank Account Details of the new first unit holder along with attestation by a bank branch manager or cancelled cheque/bank account statement/pass book bearing the account details and account holder’s name. KYC of the surviving unit holders, if not already provided. Letter from claimant/s to the Fund / AMC / RTA requesting for transmission of units. Death Certificate/s in original or photocopy duly notarized or attested by gazette officer or a bank manager. Bank Account Details of the new first unit holder along with attestation by a bank branch manager or cancelled cheque / bank account statement / pass book bearing the account details and account holders name. Indemnity Bond from legal heir(s). Individual affidavits from legal heir(s). A few points to ponder …. Importance of Nomination : It is clear that Mutual fund units cannot be transferred to another person other than in the situation where the unit holder is no more. If you are a mutual fund investor, kindly make sure you have provided nomination details for your MF investments. You can have up to three nominees on your MF investments. No nominee situation can be a mess. Transmission of mutual fund units in case where nomination is not done can be a tedious task. If the daughter is set up as the nominee in the folios of the father, then upon the death of the unit holder, she can stake claim to the units and get them transferred to her name. However, this does not happen automatically and would require the daughter to be aware of these folios. So, it would be best if the father either creates a Will or lets the daughter know about these investments pro-actively. On unfortunate demise of the father, the daughter can approach the mutual fund companies where the folios are and produce the required set of documents, the units will then be transferred to a new folio in the daughter’s name. There would be no need to sell and re-invest these holdings in this situation, and she can continue to benefit as a holder of the folio. Nominee Name Format : The problem arises if claimant’s name in the identity documents or bank record and AMC’s record do not match. For instance, the identity documents carries middle name and AMC’s record do not or vice-versa, or different spellings. So, while mentioning nominee, make sure the details match the nominee’s identity records. Information about your investments : It is your responsibility to share about your investment details (Mutual fund folio numbers) with your family members / legal heir(s). This will enable them to claim mutual fund units in a hassle-free way. If no one is aware of the investments, the investment will keep lying as unclaimed. So, make sure that you keep the nominee or someone in the loop about your mutual fund investments. Transmission of ELSS Tax Saving Mutual Fund units : ELSS mutual funds have a lock-in period of 3 years. In the event of death of the investor, the nominee or the legal heir can withdraw the amount, only 1 year after the date of allotment of units to the deceased (original investor / unit-holder). Kindly note that nominee can get the units transferred to him/her much earlier but can’t sell those until 1 year is over. Essentially, the lock-in period goes down from 3 years to 1 year in the event of demise of the original investor. In case of death of the investor who purchased the mutual fund investment, all the units are transferred to the nominee or the heir at the prevailing rate (NAV) on that day. On transfer of mutual fund units, the nominee or surviving joint holder don’t have to pay any tax. Capital gains tax is applicable only at the time of redemption of units. How to file Income Tax Return for the deceased as a Legal Heir? Nominee Vs Legal Heir : Who will inherit (or) own your Assets? Please check my funds below. Please advice if they are good. Goal is 2 cr for retirement. current age is 36. Investment in each of the below is for 2,000 per months. Thank you. You may kindly go ahead with your MF picks.. Suggest you to not to invest in RD for your long term goal like Retirement. PPF is fine. Sure Sir. I will stop RD after it’s maturity. Are all mutual funds fine as per my goal? Please let me know. Thanks a lot. Yes, you may go ahead with your investment plan in these MF Schemes. Keep reviewing your Portfolio once in a year. But, do not churn your portfolio often. * What is 200 Day Moving Average? | How to track DMAs? How to use them in Mutual Fund investment decisions? *What is Portfolio Tracking and Why Should I do it? It is understood from this article that it’s not only important to make investments properly, but also getting the investments nominated with the family members is also very important. But as far as mutual funds investments are concerned, don’t you think that it should be made mandatory for the investors either making the investment with a joint holder or make nominee of the same. 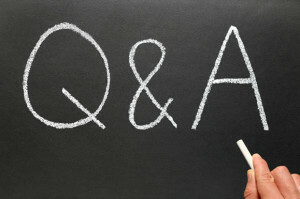 Absence from any of the above two, won’t be allowed to invest in mutual funds. Since in our country where financial literacy is very poor or below standard, we have to have some protection for the investors at the onset. Agree with your views that Nomination on MF investments should be made mandatory. Same should be the case with all types of investments! Also, the financial intermediaries can put more efforts to make their clients be aware of the importance of nomination and relevant procedures.. Thank you for your reply Sir. But how can we make it applicable? I mean is there any method for giving customer feedback to AMCs so that they can ponder on it and make it mandatory. Or submitting any feedback to SEBI so that they can also think on this for the sole interests of the investors. We can give feedback to AMCs, RTAs, SEBI and AMFI..